California's wine grape growers are having a terrible year. Not with the weather -- there have been the usual occasional challenges (heat, rain), but so far it doesn't look like 2009 will stand out as a great or terrible vintage. No, the problem is selling their grapes. Farmers without long-term contracts are finding that prices have plummeted compared to 2008, which wasn't a great year for them either. And many grapes are simply going unsold. So what's a farmer to do? Some might make their own wine. Bottled wine has a much higher profit margin -- a similar bad year for grape sales is how the Seven Deadly Zins guys got into winemaking. But consulting winemaker Jeff Gaffner (Black Kite Cellars, profile here) says most farmers will end up spending more money to produce a product they have no idea how to sell, at a time when consumers are trading down and distributors are slashing prices. Gaffner says growers without winery contracts might be better off simply leaving the grapes on the vine to rot this year. Here's a unique solution taken by one Central Valley grower: sell the wine grapes to Whole Foods as eating grapes. Usually we don't eat wine grapes because they have less liquid than table grapes, large seeds, and often more tannic flavors. But there's no reason you can't eat wine grapes, and if you've ever visited a vineyard during harvest season, a highlight is pulling some Chardonnay or Zinfandel or whatever grapes right off the vine and chowing down (spitting out the seeds of course). We bought some Carignan and Grenache and are enjoying them now. They're sweet, and I don't mind seeds in my table grapes; it makes them feel less industrial. Financially this makes a lot of sense. Grenache and Carignan in the Central Valley both sold for an average of under $250 per ton to wineries last year. As table grapes, at $2.69 per pound, consumers are paying more than $5300 per ton. I don't know how much markup Whole Foods is getting, and I'm sure it's considerable, but I'll be these enterprising farmers are getting more than $250 per ton for these. 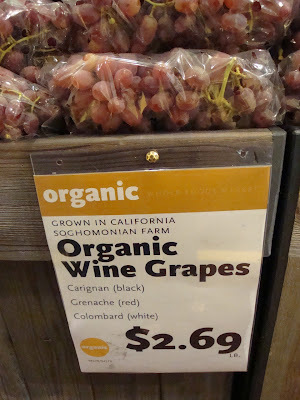 If the Soghomonians and Whole Foods are successful, look for more wine-to-table grapes in grocery stores next year. White Zinfandel saved old Zin vines from destruction; maybe table grapes can do the same. Wow, I would absolutely love to eat some wine grapes that otherwise might be left to root this year. I wonder out east here if something like that could have been done with wines from the Finger Lakes or Long Island (not that these regions were experiencing quite the same problems as CA growers have notably been). I just want the perspective of eating the grape, and what that information will bring to enjoying the varietal wines. And I just don't get that opportunity much, so very cool option at Whole Foods. Hey Cara, it's not the same as buying a bunch, but if you drive to a vineyard during harvest season they'll almost always let you taste some grapes. It is pretty interesting to try to identify the flavors of a Merlot wine in a Merlot grape. Cabernet Sauvignon is often the most difficult grape to enjoy eating because the skin is thick and, not surprisingly, quite tannic. I just drove by a vineyard in Sonoma County this afternoon that was selling Zin for 50 cents/lb. Earlier today I saw a stall at the Farmers Market selling Golden jumbo grapes for $5/lb. What does that tell you? Can you make wine from eating grapes? You sure can. The qualities of good eating grapes and good wine grapes are different, though. You want more water in an eating grape, and more concentration in a wine grape. But left on their own in a bucket, grapes will turn into wine. It's God's gift.